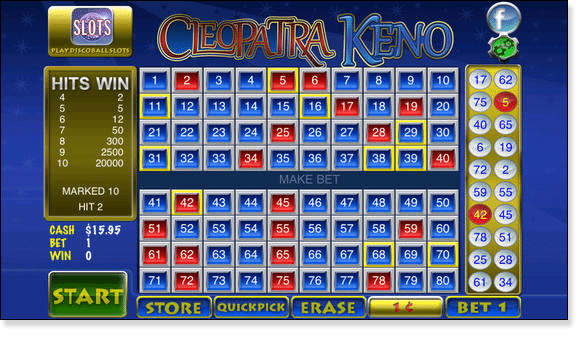 Cleopatra keno is one of the best variants of the ancient Chinese lottery game – it sticks to its ancient Egyptian theme in style, but the ambient sounds of the game replicate what you would hear if you were playing keno live at a land based casino. So far this particular keno variant is only available via social media gaming platforms, and as a result there are many social elements to Cleopatra Keno. For example, there is a live chat feature that let’s you talk to other players all over the world. There is also a Daily Leaderboard which displays players who have made significant winnings. In this version of the game, you can select 4 – 10 numbers for your keno card in the hope those numbers will be drawn for any one round. If you don’t want to choose your own numbers for the game, you can utilise the ‘Auto Select’ option that will pick any number of numbers you want for you. You can also adjust the amount of money you want to bet on each of these numbers from $1 – $1000, so there’s a huge betting range which gives you the scope to play as conservatively or as boldly as you would like (money is not real). The payout scheme for the game varies depending on how high your bet is and how many numbers you’ve selected, but the relevant pay scale you’re using is always displayed in a table adjacent to the game itself. Once you’re happy with the bets you have placed, hit the ‘Play!’ button and the keno round begins. All the keno numbers for the round are drawn in a matter of seconds so you get to find out the outcome of the game and know if you made any winnings as quickly as possible. Any winnings you make are collected automatically. After the round is up you can elect to hit the ‘Play!’ button again, which will start another round and keep all your bets exactly as they are, or you can change some of the numbers or the betting amount. There is also the option of ‘Max Bet’, which will simply maximise all your betting options. An exciting feature of the game is that you can progress through levels. The numbers you have selected which have been successfully marked off in games accumulate, which allows you to move up levels. As you unlock more levels, you will be able to multiply your winnings, play in different settings and win more bonus prizes. In Cleopatra Keno, you can spin the Daily Prize Wheel which gives away prizes like bonus credits, free games, more diamonds to unlock levels quicker and a number of other prizes. If you’re a regular keno player, make sure you make the most of this feature. While Cleopatra Keno is an enjoyable game to play, it is extremely hard to find any real money variants at the moment, although we believe this will change in the near future. There are some free versions available through the social media websites Facebook and Yahoo Games, but we are yet to find somewhere to play in the AUD currency.